Fertilization is the fusion of gametes to form the zygote. Gametes generally contain half of the chromosomes in a particular organism. Fertilization allows restoring of the chromosome number of the species as the two nuclei of gametes fuse together. 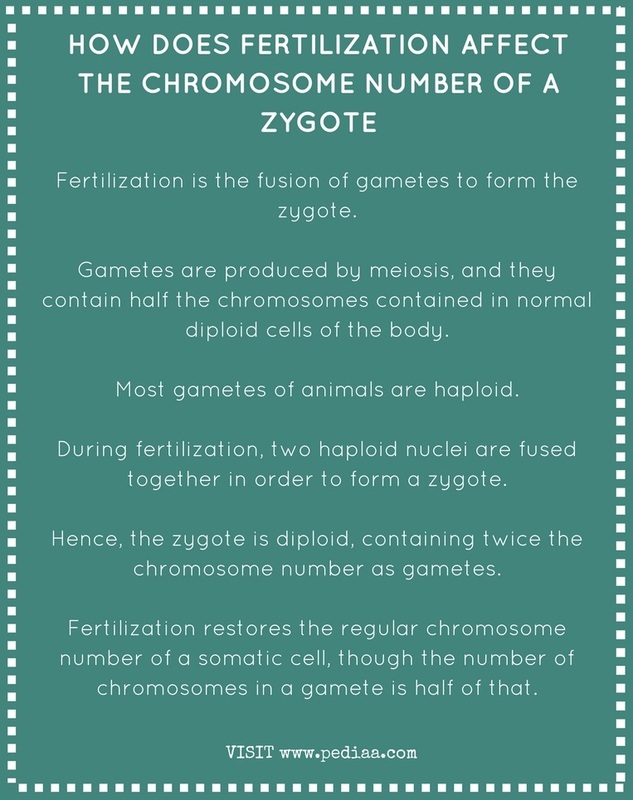 Therefore, the number of chromosomes in the zygote is twice the number of chromosomes in gametes. Fertilization is the fusion of gametes. It occurs in plants, animals as well as in other organisms. It is also called syngamy. In flowering plants, pollination is followed by fertilization, which occurs inside the ovule. Fertilization in flowering plants is called double fertilization. Fertilization in animals may occur in two mechanisms. They are internal fertilization and external fertilization. Internal fertilization occurs inside the female organism. It occurs in mammals, reptiles, some birds, and fish. External fertilization occurs outside the female organism; external fertilization can be observed in organisms like frog, fish, echinoderms, mollusks, and crustaceans. Gametes are the structures involved in pre-fertilization events. Typically, gametes contain half the number of an individual’s chromosomes. Gametes are produced by meiosis. Most gametes of animals are haploid. During fertilization, two haploid nuclei are fused together in order to form a zygote. Hence, the zygote is diploid, containing twice the chromosome number as in the gametes. As an example, a human gamete contains 26 chromosomes. Fertilization results in 46 chromosomes in the human zygote, which is the regular number of chromosomes of a somatic cell of a human. Therefore, fertilization restores the regular chromosome number of a somatic cell, though the number of chromosomes in a gamete is half of that. The role of fertilization in restoring the number of chromosomes in the zygote is shown in figure 1. However, some plant somatic cells are triploid, tetraploid, pentaploid, etc. The gametes of these plants may contain a variable number of chromosomes depending on the ploidy of the plant. During fertilization, the regular number of chromosomes are also restored in these plants. Fertilization is the fusion of gametes, which are generally haploid. During fertilization, the regular number of chromosomes of a somatic cell of a particular organism is restored by fusing two gametes with half of the number of chromosomes of that organism. 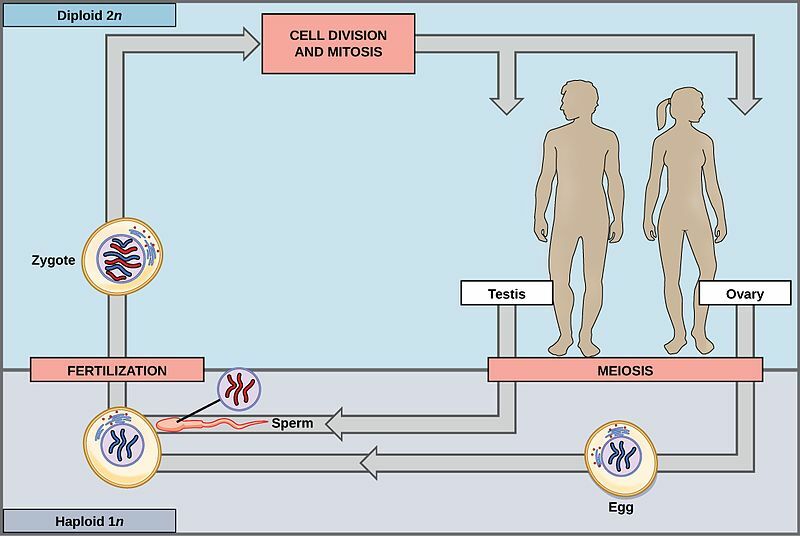 1. Cooper, Geoffrey M. “Meiosis and Fertilization.” The Cell: A Molecular Approach. 2nd Edition., U.S. National Library of Medicine, 1 Jan. 1970, Available here.